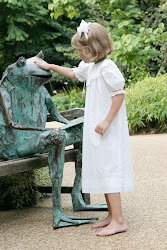 ....of peter pan collars, hair bows and bishop dresses. Yep, this is what K wore to school today. 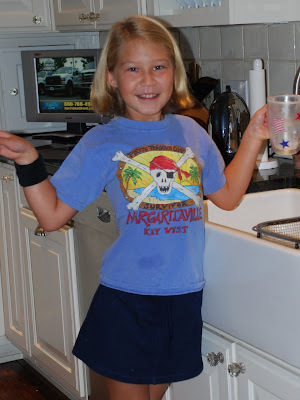 A stained Margaritaville t-shirt (thank you Uncle Mark for the t-shirt), a faded too small skort from Target. And what is up with the black wrist band???? Even worse, I am picking her up early from school today and we are going out of town. She will be wearing this getup on the plane. Sigh. I just found you blog recently and wasn't aware you were adopting again! I am also, if you would like an invite to my blog just shoot me an e-mail at strob06@sbcglobal.net. I feel your pain on the clothes. Madina is just over 4 now and insist's on "cool" clothes! That means jeans and a t-shirt with some character on it. I miss last year when she was all about dresses! And my next one is likely to be a boy so my dress-up days are probably over.